Ready to wallow? 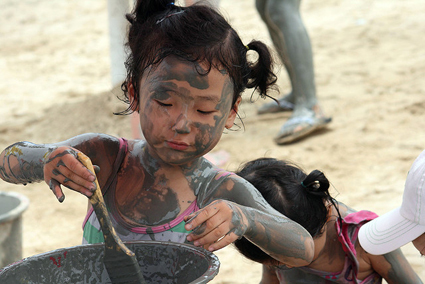 On June 29, the World Forum Foundation is encouraging children around the world to get muddy in honor of International Mud Day. We take a moment to pay tribute to this ooey gooey carpet-staining substance. Squish, squash: Mud play offers unique tactile, sensory experiences that are vital to a child's developing brain. As children run mud through fingers, scoop mud from containers, and create mud pies, they develop their hand-eye coordination and learn about cause and effect. Hold the hand sanitizer: Research shows that kids who play in dirt (including very wet dirt) develop stronger immune systems that can pave the way for better health throughout their adult lives. Mud is also good for the heart, and not just because of all the cardio exercise that it inspires. A 2010 study from Northwestern University found that exposure to the germs and pathogens found in dirt can reduce a child’s risk of cardiovascular inflammation in adulthood. Of course, kids don’t need any prodding to get outside and get muddy. Share photos of your muddy kid by posting to Twitter or Instagram with the hashtag #mymuddykid. We’ll feature our favorites on Facebook and our blog. Image via let the children play. Check out this wonderful blog for mud recipes and so much more! We know that already, but the question lingers: What does “high-quality” mean? 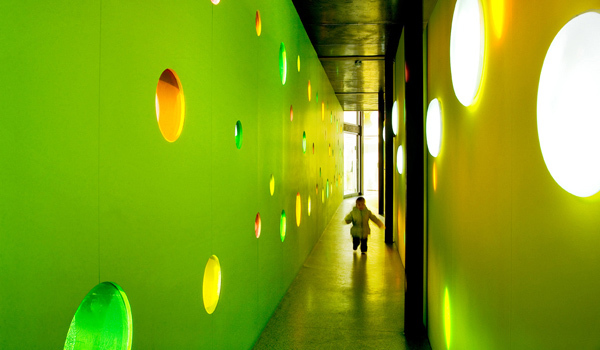 Does a high-quality preschool look like this? Manhattan mother Nicole Imprescia would likely argue the former—in 2011, she sued her child's preschool because, in her words, "The school proved to be not a school at all, but just one big playroom." Imprescia worried that all this play was ruining her tot's chances of getting into an Ivy League college. Meanwhile, many early childhood educators emphatically believe that preschool should be one big playroom—and don’t forget about an adjoining outdoor playspace! A recent study by Oregon State University found that the key social and behavioral skills that play develops -- such as paying attention and persisting with a task -- are better predictors of whether or not a child completes college than his or her academic abilities. Either way, Kenny argues that the “right curriculum for kindergarten” is, without a doubt, play. 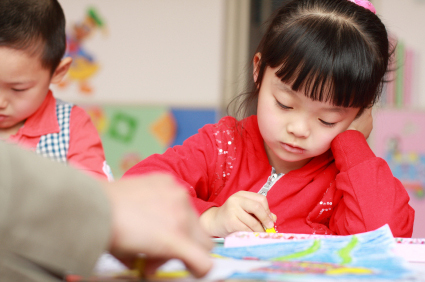 As we begin to invest more in “high-quality” early childhood education, let’s make sure that “quality” doesn’t mean filling out worksheets at a desk. We know that parents like Imprescia just want what’s best for their children. 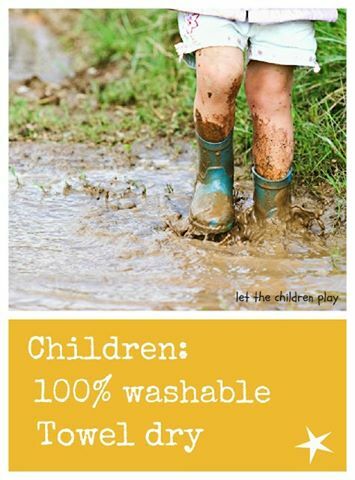 Let’s listen to the research and make sure that “quality” includes copious amounts of active, creative, sensory, and social play—in the mud and beyond. What does a quality preschool mean to you? Top photo via iStockphoto. Bottom photo via Shawn Perez (cc). Though child’s play is naturally compatible with scientific exploration, the United States is failing to nurture its little scientists. We rank 23rd in science among developed countries, diminishing our ability to compete in the global marketplace. We obsess over test scores, but we should really be encouraging more students like Lauren Rojas (pictured above), a seventh grader in Antioch, Calif., who set out to test the effects of altitude on air pressure and temperature for her science fair project. And what better way to do that than to launch a homemade “rocket” into space using a do-it-yourself balloon kit? Lauren added her own creative touches to the balloon, fashioning a shiny rocket structure that included a Hello Kitty pilot. "I liked her ever since I was 6 years old," Lauren told the New York Daily News. "My love for Hello Kitty has never gone away and I thought it would be really fun to add a toy inside the rocket." The doll got quite a ride, reaching an altitude of nearly 18 miles. As the balloon expanded to 53 times larger than its original size at takeoff, it eventually burst open, landing in a tree 47.5 miles from the launch sight. Lauren was named one of four top award winners at her science fair and will go on to compete in a regional competition. While she learned an unforgettable science lesson on altitude, air pressure, and temperature, we stand to learn a valuable lesson too. Child’s play is not a ‘frivolous’ activity that distracts from ‘weighty’ subjects like science and math. Rather, it is a core component that we must nurture from pre-K to high school—and beyond. Photo via Contra Costa Times. I first met Jack when he was in preschool and worked with him for several years. A chubby blonde who was happiest curled up on the couch and browsing books about lighthouses, Jack had trouble with everyday activities, like getting dressed. When there was a lot of noise or activity, he became easily overwhelmed and would shut down almost entirely, unable to say or do anything. Jack had sensory processing disorder and a learning disability. ‘Sensory processing’ refers to our ability to determine what sensory information to pay attention to and then how to handle and react to it. For most people, this process takes place on a largely unconscious level and in milliseconds. Our brains are amazing things! Movement is critical for activating this system, but with low core strength and poor coordination, Jack fatigued quickly. Our work initially focused on strengthening and building his endurance. As Jack moved into first grade, the emphasis shifted to coordinating his body movements. 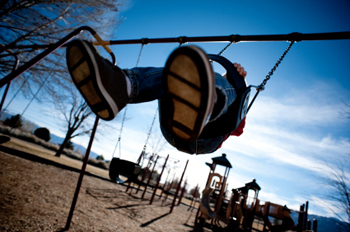 By the middle of first grade, he reached a tipping point when he learned to “pump” on a swing. At recess, Jack would charge out to the playground, making sure he reached the swings before his classmates. His teacher had never seen him run before. Jack spent the entire recess swinging. His motor abilities grew exponentially from that point on. Not only that, his teacher noted that his recess swing sessions helped him focus better in the classroom and improved his learning. Many years later, I read in the local newspaper that Jack was on the high school varsity football team! From the day I met him, he had progressed from a lone couch potato to a lone swing enthusiast to a team player in a physically demanding sport—a moving testament to the power of play. This story is adapted from an excerpt in Your Child’s Motor Development Story by Jill H. Mays. See Jill's other guest post, In the wake of tragedy, six tips for coping through play. How do you recreate the value of playing with sticks and dirt? When it comes to playing, industrial designer Cas Holman admits, "You really can't beat letting kids play in nature." But that hasn’t stopped her from trying. 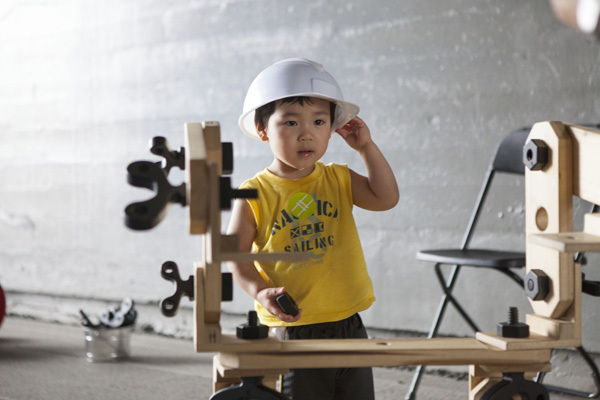 The Workyard Kit, Holman’s latest invention, riffs on the idea that “play is children’s work.” Consisting of wooden planks, ropes, pulleys, hooks and pails, the kit is designed for deeply engaging, open-ended play. Or, as Holman puts it: "cooperative, constructive imagining." Photo by Rowa Lee, courtesy of Friends of the High Line. 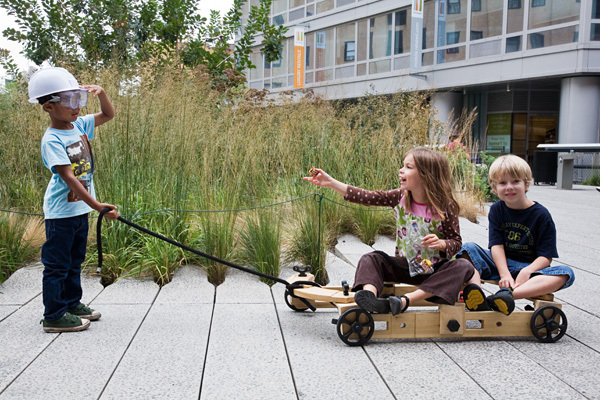 A key creative force behind Imagination Playground, Holman was approached by Friends of the Highline and asked to come up with a way to engage families and kids in New York City’s High Line Park, which converted an old railroad into green space. She wanted to take advantage of the narrow park’s many nooks and crannies and harness its industrial spirit. Photo by Joan Garvin, courtesy of Friends of the High Line. And so the Workyard Kit was born. Seeing its success, Holman realized that the kit could have potential beyond The High Line and set about designing it for mass production. The kit is currently being tested at a number of pilot schools around the country, where Holman hopes it can enhance STEM curricula. In fact, Holman says, STEM should really be STEAM, because without an ‘A’ for ‘art,’ how can children flex the creative muscles they need to excel in science, technology, engineering and math? With these parts, how can you make something that would hold a 10-pound bag of potatoes? How can you make something that would fly to the moon? What can you build with 10 parts? Left photo by Rowa Lee, right photo by Adriana Stimola. Courtesy of Friends of the High Line. If we here at KaBOOM! got our way, every classroom would have a Workyard Kit and every schoolyard would have an Imagination Playground. Because when it comes to true learning, hands-on, creative, collaborative play beats a standardized test any day of the week. Cas Holman teaches Industrial Design at Rhode Island School for Design and is part of its STEM to STEAM initiative. For more information about the Workyard Kit and to learn about a backyard version, visit WorkyardKit.com. To see Cas Holman’s other projects, visit CasHolman.com. To find the Workyard Kit on the High Line, visit TheHighline.org. When asked about his school day recently, my nine-year-old son was faster than usual to share. “We have a new PE teacher and class is more fun than last year.” My seven-year-old piped in, “We play games like capture the flag and ultimate soccer.” Nodding my head between bites of grilled chicken, I knew I wanted to meet this physical education teacher who was generating such enthusiasm at our dinner table. Lindsay Frank—or Ms. Lindsay, as her students call her—believes in the value of play, and this sets her apart. Rather than focusing on drills, as she was taught by her education professors, she wants her students to take advantage of their natural desire for fun. Her inspiration comes from a 6th grade PE teacher who made PE so wonderful that Ms. Lindsay could not imagine a better calling. This trend isn’t necessarily setting the stage for an active lifestyle later on in life -- 70 percent of kids give up sports entirely by age 13. When asked by Michigan State University researchers why they quit sports, kids almost universally said, "It's not fun anymore." With almost half of her students under the age of 10, Ms. Lindsay is working with them at a time when they are shaping their future preferences and motivations. 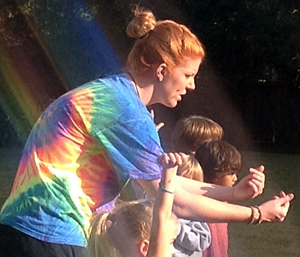 By making the activities in her class accessible to all students, appropriate for their ages, and, most importantly, fun, she helps them develop positive attitudes toward physical activity, which teaching them essential life skills, such as confidence, cooperation, and creativity. And the way I see it, these skills are far more important than throwing a perfect pitch. as many fellow players as they can. Tagged players must kneel on the ground, remember who tagged them, and stay until they are freed when the person who tagged them is tagged. Fun comes when students tag each other at the same time and must play rock-paper-scissors. The loser has to kneel and the winner gets to stay in. Players are divided into two teams. There are no boundaries, no goalies, and no positions. Players must work together to score on soccer goals. Anyone can defend the goal, but they cannot use their hands unless they are in the goal. If a goal is scored, the person who retrieves the ball from the goal may throw it out or kick it to continue the game. Because there are no rules about where players should be on the field, players get to find out by themselves if they prefer to kick the ball on or try to defend the goals. It is a continuous play game with little lag time so players are constantly moving. Whether inventing a recipe, building a club house, or sewing a rag doll, kids love to make things. Not only do they get to learn for themselves what works (and what doesn't! ), but they get to enjoy and show off a tangible product at the end of it. ...the idea of making things, taking things apart and sharing has not been something new, it’s something that’s always been there for them. The average maker isn’t just a 35 year old guy, it’s becoming a 10 year old girl or boy with a 3D printer. 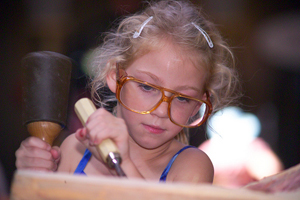 Get your kids started at one of the many family festivals geared toward hammer-wielding children. This Saturday, Sept 22 in Washington, DC, the National Building Museum is hosting The Big Build, where kids can build a brick wall, construct a log cabin, carve stone, compete in a nail driving contest, and play with huge foam blocks in Imagination Playground (provided by yours truly!). 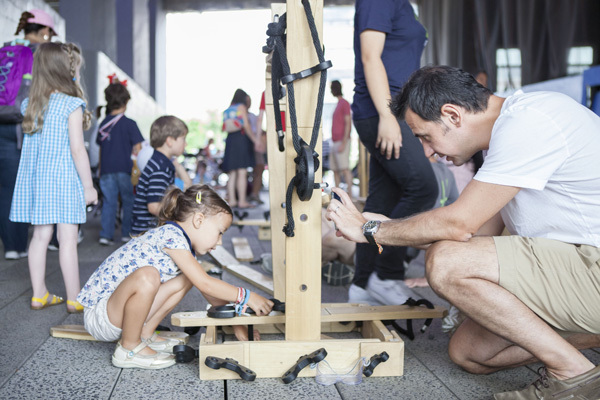 Next weekend, September 29-30, is the World Maker Faire, a "family-friendly festival of invention, creativity and resourcefulness" in New York City. 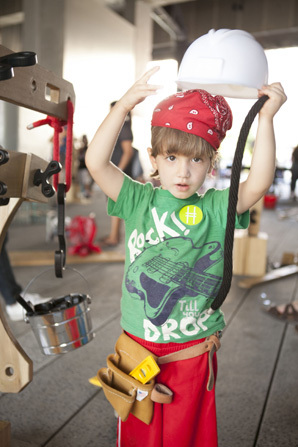 Mini Maker Faires are happening all over the country (and globe!) -- find one near you here. 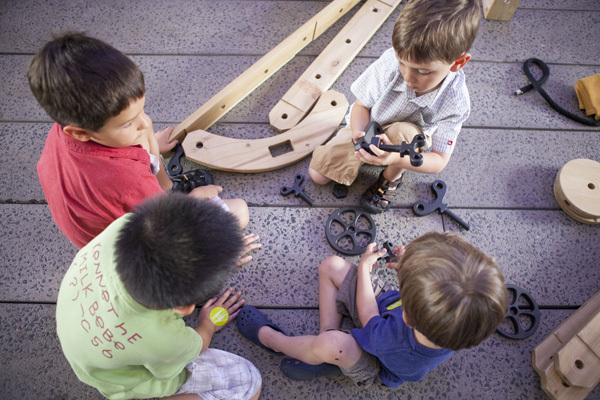 The National Building Museum is also hosting a Discover Engineering Family Day in February. It's time to break out the toolbox, open the craft drawer, rummage through the pantry, and start making! Top photo via National Building Museum. Would you send your child to a school that gives its students hammers instead of standardized tests? 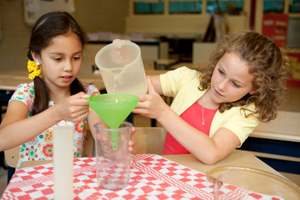 Brightworks, a K-12 school in San Francisco, takes experiential learning to a whole new level. As it proudly proclaims on its website: "Our students fly kites, experiment with wind tunnels, and build turbines." 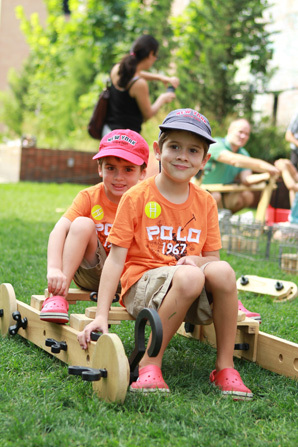 Founded by renowned tinkerer Gever Tulley, the school abides by the philosophy that tinkering and play are at the heart of learning. Student achievement is measured not by testing, but by exploration, expression, and exposition. Would you send your child here? With their dreary hallways and drab facades, most schools look more like hospitals than like centers for creativity, learning, and play. How can we expect to inspire students in such uninspired surroundings? These amazing schools break the mold. 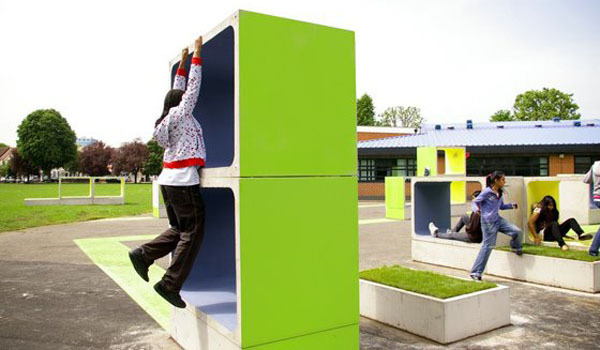 They understand that playful environments are conducive to serious learning, whether in the classroom, hallway, or schoolyard. Let's hope more schools follow their lead! 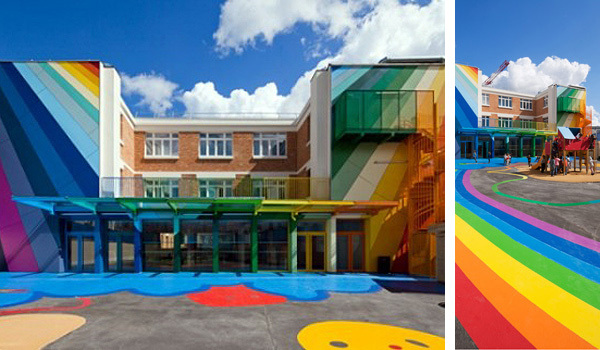 Ecole Maternelle Pajol, a kindergarten in Paris, France. Photo via Palatre & Leclère. 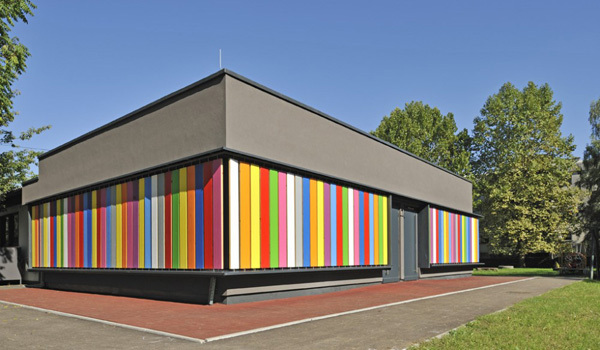 Kindergarten Kekec in Ljubjana, Slovenia. Photo via Arhitektura Jure Kotnik. 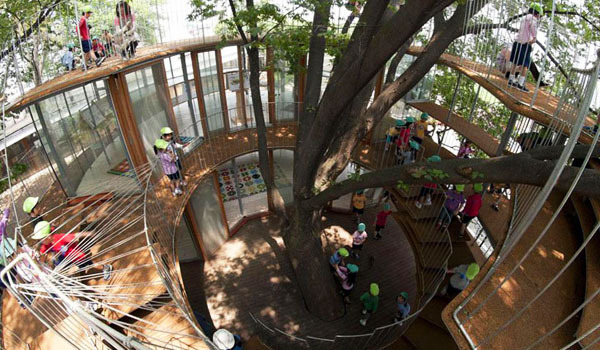 Fuji Kindergarten in Tokyo, Japan. Photo via Domus. 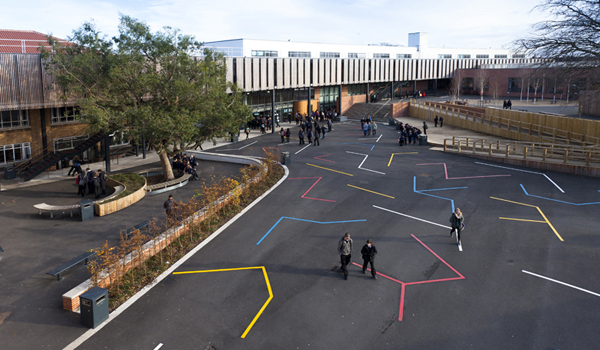 Villiers High School in London, UK. Photo via Clara Gaggero. 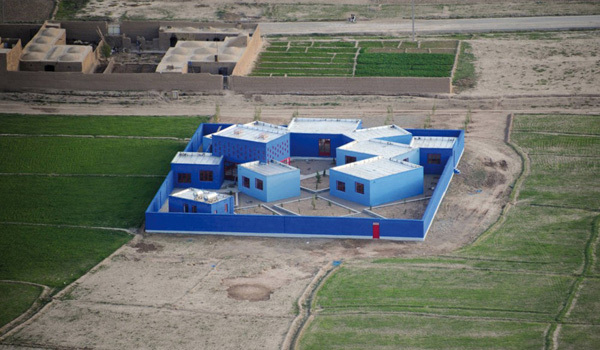 Maria Grazia Cutuli Primary School in Herat, Afghanistan. Photo via IaN+. 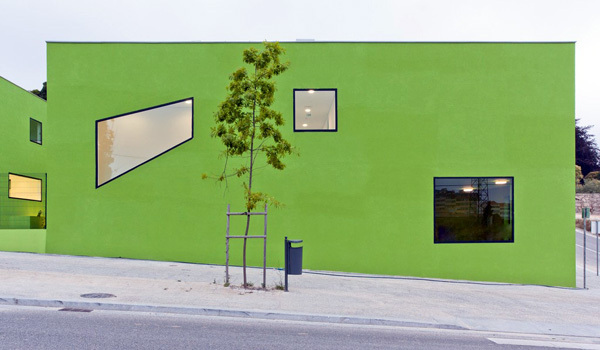 Arreletes Day Care Centre in Els Alamús, Spain. Photo by Jordi Anguera, via Xavier Vilalta Studio. 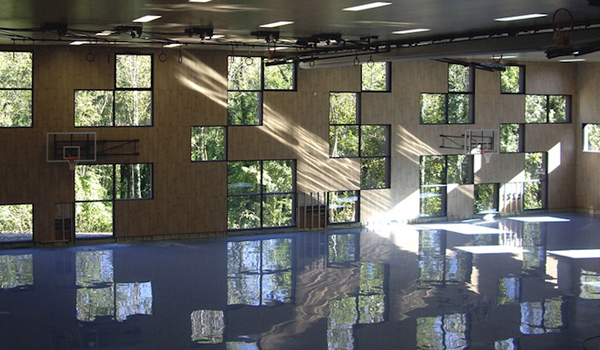 ESGE Secondary School in Genolier, Switzerland. Photo via ipas. Antas Education Centre in Porto, Portugal. Photo by José Campos via Arhitectural. Cotham School in Bristol, UK. Photo by Jaimee Woodley, via Playscapes.